The Acmon Blue Butterfly is a small butterfly (about 0.75 - 1 inch across) and has silvery blue wings with black spots and an orange band. Females tend to be more brown than blue. Two features that distinguish the Acmon Blue from some other similar Blue butterflies is that the orange band is found on the hindwing only and the fact that the Acmon Blue can be found flying in Arizona most times of the year (other Blues typically fly in the summer months only). 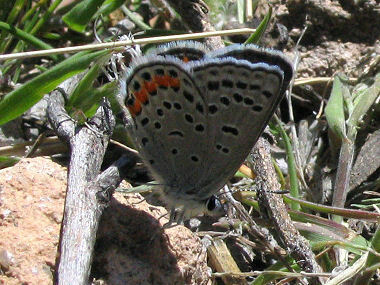 The blue wings of the Acmon Blue in the photographs give it away as a male. The host plants for the butterfly include many species of buckwheats and lotus as well as freckled mildvetch and sweet clover. 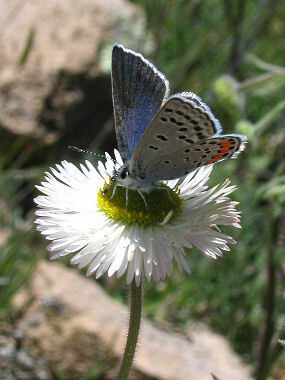 The Acmon Blue is found throughout Arizona (except in the southwest) as well as in California, Nevada, Utah, Colorado and New Mexico.